Dare I say that this is one of the most delicious things I’ve eaten in a while. And I didn’t even have cheese on mine. Because #dairyfree. Not only was I a raving fan of my own work, but my husband requests it every week. Please take the time to “sweat” the eggplant slices for the best possible results. 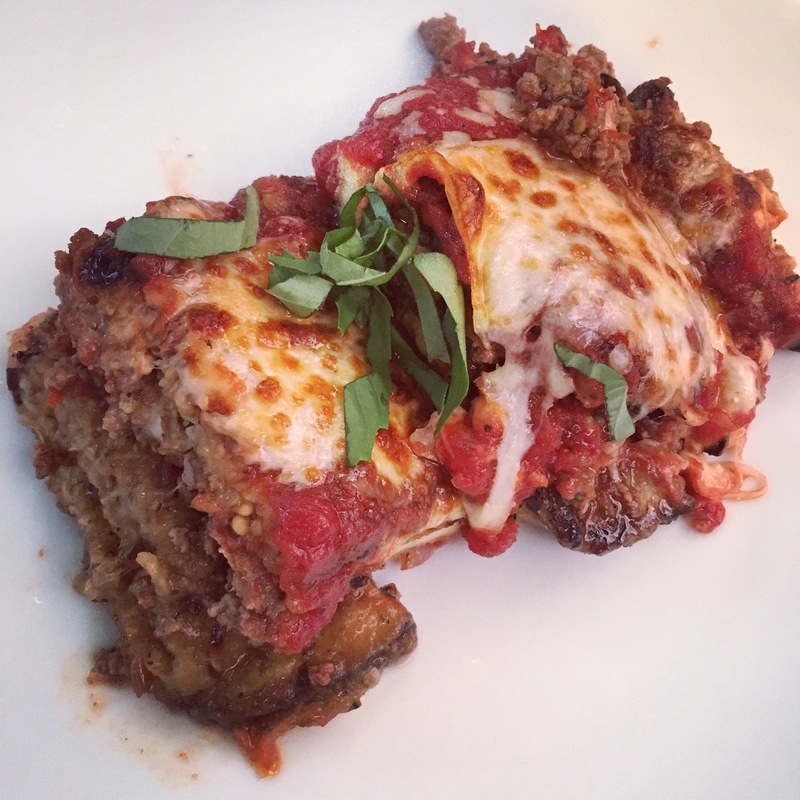 Soggy eggplant makes for sad lasagna. Nobody wants that. This dish is really simple to make but frying the eggplant can be a bit time-consuming so make sure you plan ahead! Lay out eggplant slices and generously sprinkle with salt. Leave for 20 mins or so, you will start to see water being wicked away from the eggplant (they will look like they are “sweating”). Take some paper towels or a clean dish towel and press into the eggplant slices to absorb moisture. Do this with all the slices and set aside. Take out 2 bowls, in one whisk eggs. In the other add starch, salt and pepper and combine well. In your clean skillet, heat up a 1/4 -1/2 c. of olive oil. Take your eggplant slices and dip into egg mixture, then lightly coat with starch and drop gently into the hot oil. Flip eggplant when first side has browned. Lay fried epplant in the 8×8 dish in an even layer and then top with marinara sauce. Layer on some cheese (optional). Turn on your broiler and bake the lasagna before serving to get the cheese all melty and browned. Garnish with some basil and serve. NO NEED TO SOAK, INSTEAD CUT EGG PLANT THIN, DIP IN EGG WASH, DIP IN PARMESAN DRY CHEESE LIGHTLY, AND PUT ON COOKIE SHEETS BAKE AT 375 DEGREES UNTIL THE EGG PLANT IS GOLDEN BROWN, ABOUT 20-30 MINS. THEN LAYER. ALSO ADD BAKED MUSHROOMS AND ROASTED BELL PEPPERS. UM GOOD!